Today is Good Friday and I remember what I was taught in Sunday school when I was a kid, about Good Friday. But whilst I still treat the day with well-placed respect, I just couldn’t help using a play on words here and say that it has indeed been a good Friday. Me and my hubby have been lounging today for the most part. We did our venturing out into the town centre yesterday, so we stayed in today and listened to the wind whirling things around outside while we watched some movies. I always like days like this. Just me and my hubby sitting around not really “doing” anything, but just loving it. We watched most things that we both wanted to watch and then this afternoon, my hubby fell asleep on the sofa next to me, so I grasped my chance to watch a nice melodramatic movie. The kind of movie that I would watch when I was a single girl, lying around on a Sunday, deciding to not get dressed, and surrounded by my potato chips and drinks. I love being married, but sometimes I miss being able to just slob out on Sunday and watch tv movies and graze on whatever is handy and not have to think about what I am going to cook for dinner. So I grabbed the remote and switch over just in time to see a good one. It was a romantic type movie starring Lindsay Wagner. I have always liked her since back in the day when she was the Bionic Woman. I was a little kid, but I used to run around outside acting like I was bionic too. I used to make the scraping sound that was the sound effect for the bionics in action when she ran. I was a full on Lindsay Wagner girl. So it got me feeling all nostalgic to see she was in this movie. I watched nearly all of it before my hubby woke up. I guess he was really tired. Anyway, he watched the last bits with me and even waxed nostalgic about our shared memories of those bionic days gone by. So he was cool with watching it. It proved to be a satisfying bit of nostalgia in many ways. The weather was back and forth all day and couldn’t decide how it wanted to be. It was cloudy and then sunny and then at one point it even sleeted. It was very, very windy all day. Our wheelie bin or trash can, as we would call it back home, was moving back and forth, threatening to topple over. I have a bit to tell about our wheelie bin. Today was the day to have our garbage pickup and they came early today. Well, our neighbor, an older lady, did something great to start our good Friday. She actually brought our wheelie bin back down from the sidewalk for us when she brought hers down. And this was big, because she never speaks to us when we see her. We usually just shrugged our shoulders when she doesn't speak and go on with our lives. So we were truly shocked that she made such a gesture today. I am always a true believer in thanking people who are kind to me and I was truly touched by her out of character gesture. Despite some days that I have, I still believe that generally people are good inside. So I wrote her a note on a card I had and thanked her for her kindness and wished her a Happy Easter. I dropped it through the letter slot in her door. So that was yet another good thing about this good Friday. It really made up for Thursday that was not so great at all. This evening, me and my hubby had our dinner, or “tea” as they call the meal here. We had a light dinner since we had pigged out on junk earlier in the day. 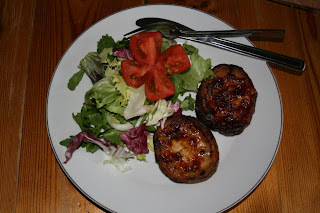 We had a couple of potato skins with cheese, which got a bit extra brown, but they were still edible. And on the side we had a nice green salad. I also felt a creative rush and decided to top the salad with a tomato that I fashioned into a tomato flower of sorts. I will post a picture of it. Then for dessert we had some cupcakes that I made on Wednesday. 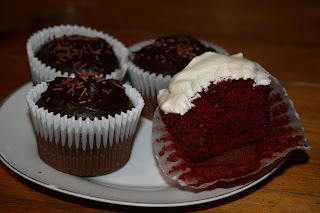 I made really tasty chocolate cupcakes with chocolate sprinkles and red velvet cupcakes, which are my very favorite ones. Red velvet cakes and cupcakes are made a lot back where I come from, so making them here is my way of keeping a bit of back home alive in my new home here. You will see in one of the pictures that my Brit husband has come over to the red velvet side of things and adores red velvet cake too. He took a big bite out of one before I took the picture. Gotta love boys who like red velvet cakes on a good Friday. Enjoying reading your blog - keep up the good work!! Thanks for your comment on my blog and I see that you are also a guy who loves a good cake like my hubby. 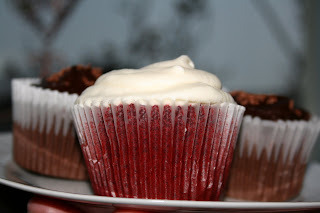 Red velvet cake, whether it is a full size cake or a cupcake is marvelous! It is probably my favorite. And thanks for your compliments on my posts. Have a great day! I'm new to the blogging world (blogosphere?) and found your blog recently. I like to read entries from the beginning, and this is how far I got today. I wanted to say hello now, as it might take a long time to get to the current entries. I will definitely try out those Red Velvet cupcakes. They look delicious!